May 2, 2017 – IK Multimedia is proud to announce the release of iRig Recorder 3 for Android™devices, a professional quality field recording app which supports video recording and includes a wide collection of pro audio effects, expanded sharing capabilities via online services and social media as well as professional exporting features. iRig Recorder 3 offers users the ability to produce superb sounding audio/video recordings directly on their device, share them with the world or export them for further editing. iRig Recorder 3 is the perfect companion to IK Multimedia’s iRig digital microphones and audio interfaces for Android. iRig Recorder 3 in combination with an IK microphone or interface offers everything needed to get professional quality sound while recording mobile audio for video, interviews, concerts, podcasts and more. Offering an expandable collection of up to 17 effects, iRig Recorder 3 can be enhanced with professional processing options such as Normalize, Stereo Imager, Compressor and 3-band EQ as well as creative audio effects including Morph, Reverb, Chorus and Delay. They can be applied to audio recordings for sound optimization or creative use, doubling the number of effects available in the previous version of the app. Another new feature allows users to add text and photo markers to recordings in real-time to make editing easier than ever. Record “selfie” videos, live performances, lectures, speeches, interviews and much more at the touch of a finger. iRig Recorder 3 is the go-to app for both professionals and enthusiasts who need a tool capable of greater versatility when it comes to creating high-quality video with great audio that can be shared via social media immediately. One of the features that truly makes iRig Recorder 3 stand out from the crowd is its ability to export the recorded content in separate files for convenient editing in a DAW or third-party video editing software. Content can also be easily shared via a large selection of online services and social media like Facebook®, WhatsApp™, DropBox™, Google Drive™, Twitter™, E-mail, Wi-Fi™, or FTP file sharing, in a variety of sizes and formats. 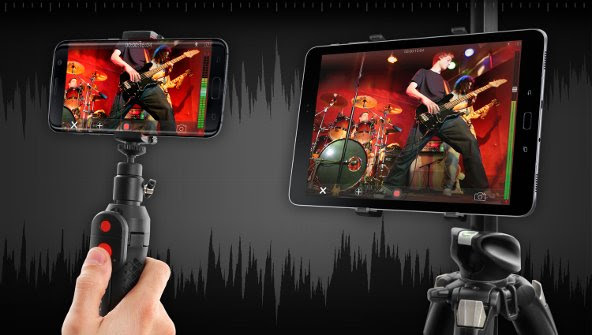 iRig Recorder 3 for Android is available as a free downloadable app from the Google Play™ Storewith the option of expanding the effects collection via in-app purchases.